Bought a potted daylily at Lowe’s/Home Depot that was labeled as white, but it turned out to be this gorgeous red velvet. Still wish it had been the white one. It’s planted near the crepe myrtle by the driveway. Visited with Tom Talley of the daylily society at the Benton Farmers Market on 6-1-2014. Described this to him and he felt pretty sure it was probably Red Volunteer. Researched it online and I think he’s probably right, but since it was mislabeled, I can’t really know for sure. Daylily 'Red Volunteer' can grow to a height of approximately 3.25 feet (that's 1.00 metres in metric) so ensure you have enough space in your garden for this plant. Your garden's USDA Hardiness Zone (8a) is within the ideal range for Daylily 'Red Volunteer'. The recommended range is between Zone 3 and 9. A soil ph of between 6.0 and 7.0 is ideal for Daylily 'Red Volunteer' as it does best in acidic to neutral soil so test your soil acidity often. 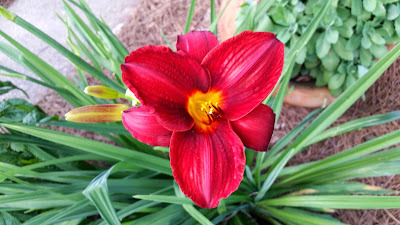 More information about Daylily 'Red Volunteer' is available in the Folia gardener's wiki. 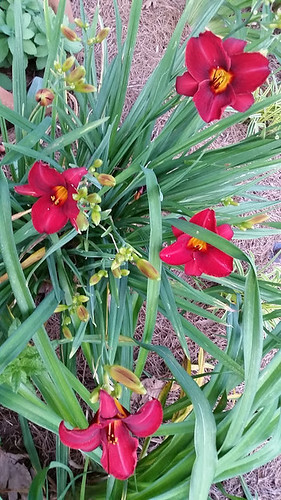 All Daylily 'Red Volunteer' Care Instructions have been kindly provided by our members. Looks like this has new growth coming up. This finished out a few weeks ago but is putting out new blooms now. Cross-pollinated this with a Midnight Magic flower. Got a small number of reblooms the past couple of weeks. Leaves are about 6" tall.